Three Cognacs of exceptional quality, each the epitome of all that makes the Grande Champagne terroir the premier cru of Cognac. All three Cognacs, while unique in themselves, share the same delights that a good Cognac posesses. They are full bodied, round, mature, with wonderful rancio that only comes with the years of aging it takes to allow an eaux-de-vie to develop to such a quality. 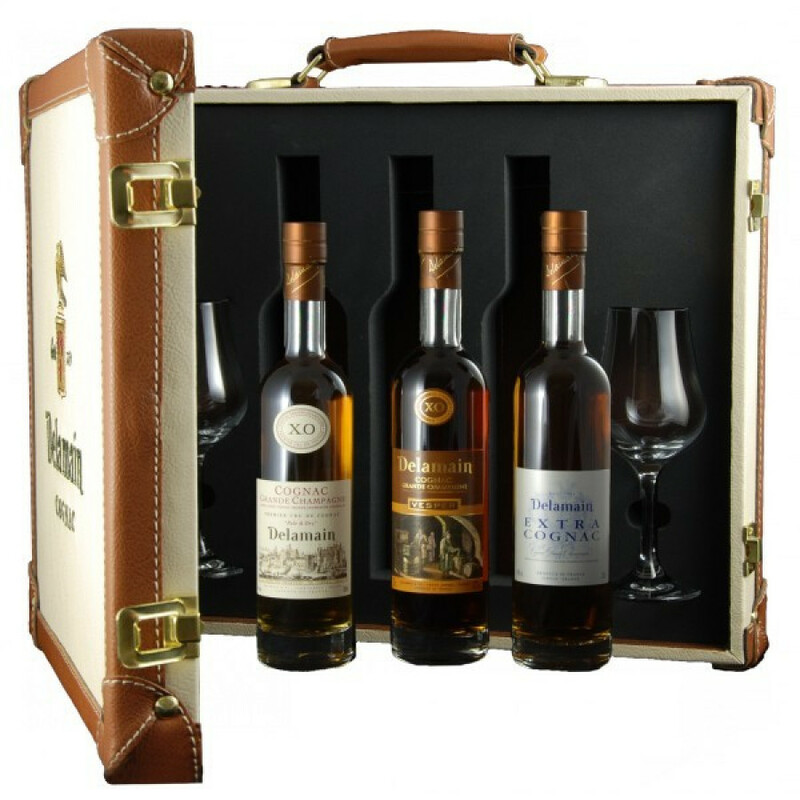 The Delamain Attaché Box Ambassador Tasting Set is a wonderful way to own three great Cognacs from this classic producer. Within the box are 20cl bottles of the following: the Delamain Pale & Dry XO, the Delamain Vesper XO, and the Delamain Extra. It also comes with a pair of lovely tasting glasses. Each of the Cognacs is from the Grande Champagne terroir, and together the purchase adds up to 60cl of Cognac. The Pale & Dry XO: Delicate, great length, fruity, and mellow. Named 'Pale & Dry' because the Cognacs used are naturally much paler than other Cognacs of this age , and 'dry' because it has only its natural sweetness. The Vesper XO: Full, mature, extremely mellow, and wonderfully fruity. The Extra: Shows deep maturity and a full-bodied bouquet. It is the perfect expression of an old Cognac from Grande Champagne - far exceeding the quality and age of an XO. This is a wonderful tasting set that would be the perfect gift for any Cognac connoiseur.